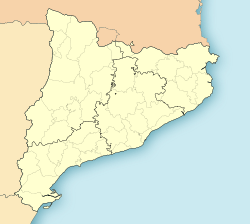 Arbolí is a municipality in the comarca of the Baix Camp in Catalonia, Spain. It is situated in the west of the comarca in the Prades mountains. A local road links the village with the C-242 road. ^ a b "Ajuntament d'Arbolí". Generalitat of Catalonia. Retrieved 2015-11-13. ^ "El municipi en xifres: Arbolí". Statistical Institute of Catalonia. Retrieved 2015-11-23.